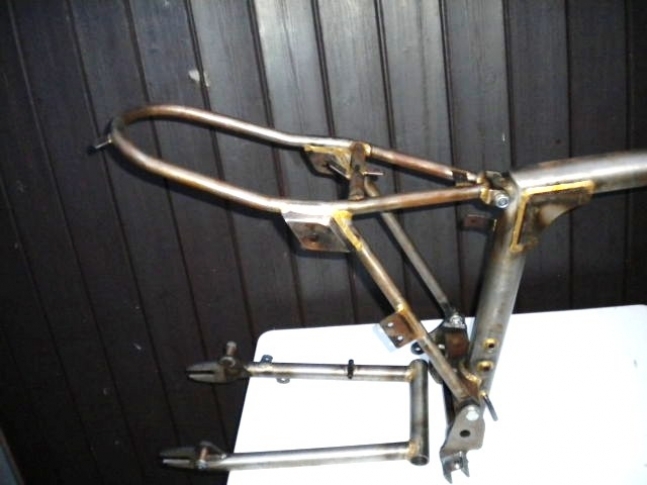 The last batch of BSA B40 Otter frames supplied by Sammy Miller. 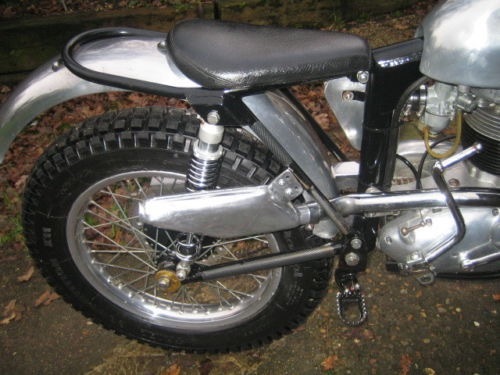 The Sammy Miller BSA B40 "Otter's" 2005- 2008. 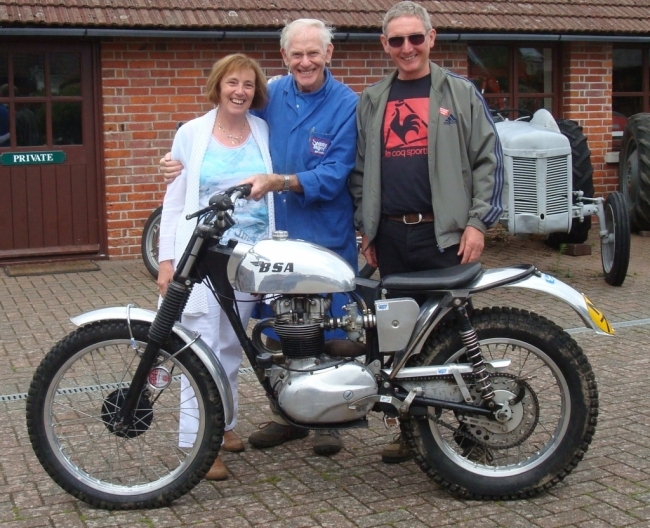 This is a picture of Naomi and Terry Flashman with Sammy, and one of the bolt up framed, BSA "Otter's"
The machine Dave Shave eventualy bought. 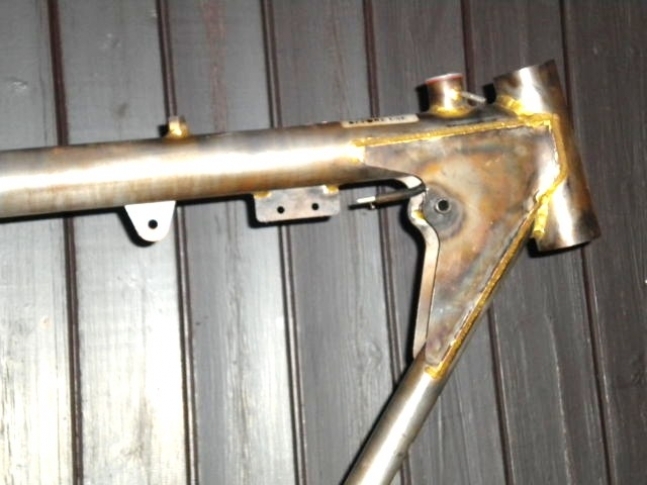 This is the picture I found of the bolt up framed “Otter” frame that Sammy Miller had built from about 2005-6. 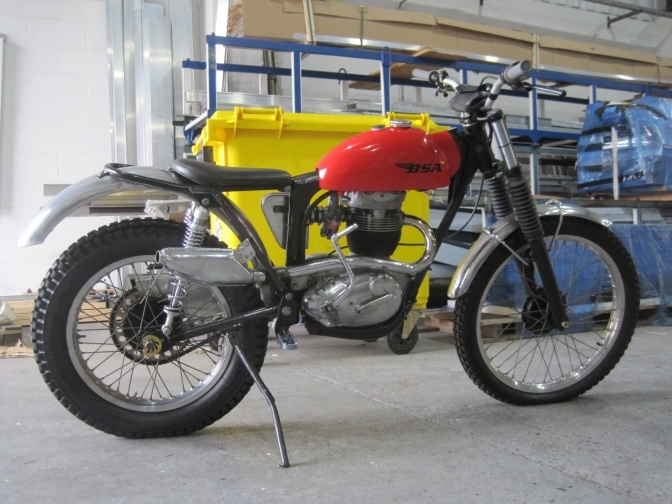 This bike was said to have been built by staff at Sam’s workshop at the museum in 2007-8. The bike comes from the Kent area of the UK. The staff on the stands that these bikes were exhibited on at the time, said that this frame had been designed so that a bike built using it would qualify for all Pre 65 trials in the UK, including the Pre 65 Scottish. Sam used to use the 1971 four stud forks on these bikes to has you can see. 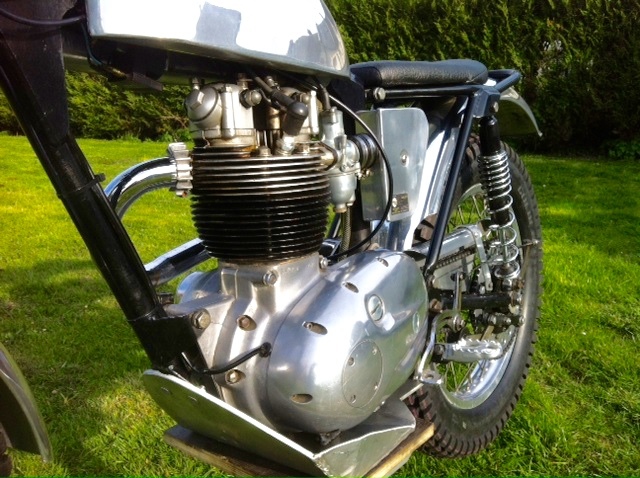 If you look at the steering head you can see that it differs from the Faber frame steering head, as it is machined in one without the BSA shape. 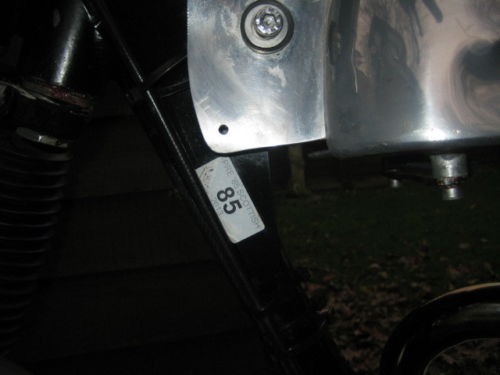 The gusseting around the steering head is also more like the plates that BSA used to fit, and on Sam’s frame there is a spacer boss to take a second tank fitting bolt as well as the normal screw down type. This is why the Miller alloy tanks have a tacked in tunnel extension towards the front. Most of the other fitments are the ones carried on from the Faber “Otter” frame; I think the seat base is the only different part. If you look in the Sammy Miller Products catalogue you will find most of these parts still listed. 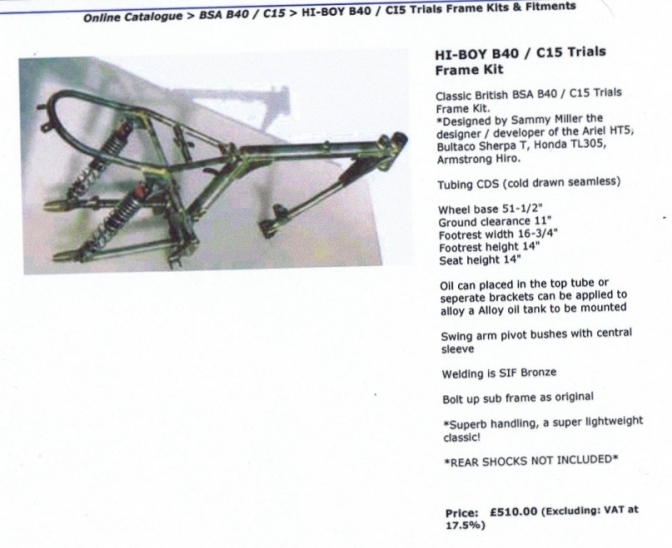 I will try and find out more information about these frames, the tubing used, and try and find out who built them for Sam? I think a few of these bikes went to Spain and France? This is another "Sam B40 Otter", taken at the Sammy Miller Museum. 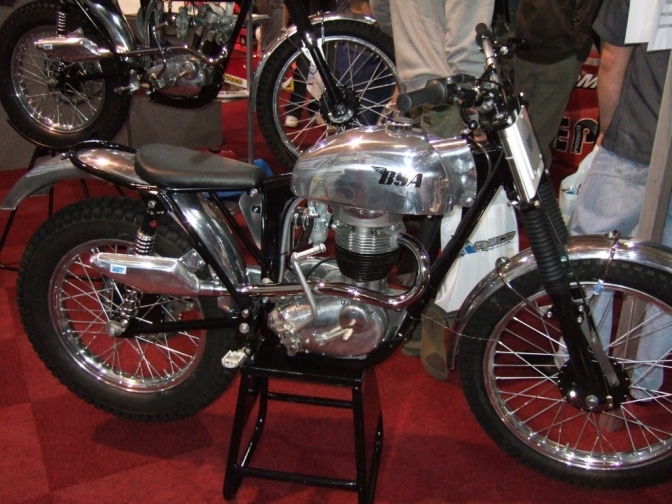 And this bike at at the 2007 Offroad Classic show. And this Frame kit at the 2008 event. I have had this reply from David Shave, about the bike in the middle picture. Just letting you know , I have been looking at your site and was pleasantly surprised to see the bike on Sammy Miller's page is the bike I now own. I believe the picture you have, was taken at the previous owners warehouse in Ashford Kent. I own "Stevens Trials in Meopham" , I have ridden the bike around half a dozen times and have had some good results. Regards Dave . There you go then the site works? Keep it up. ~Oo> Regards Charlie. 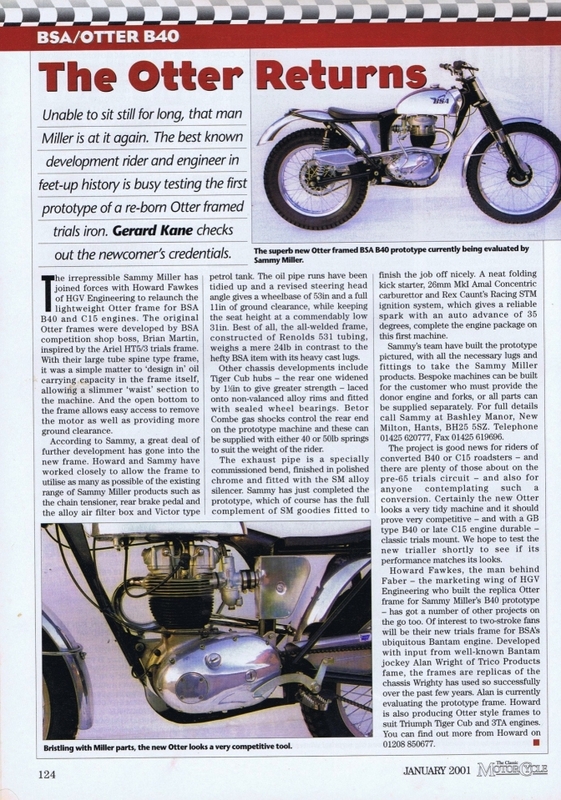 Below,Just found this very good example of the Miller Otter frame's. 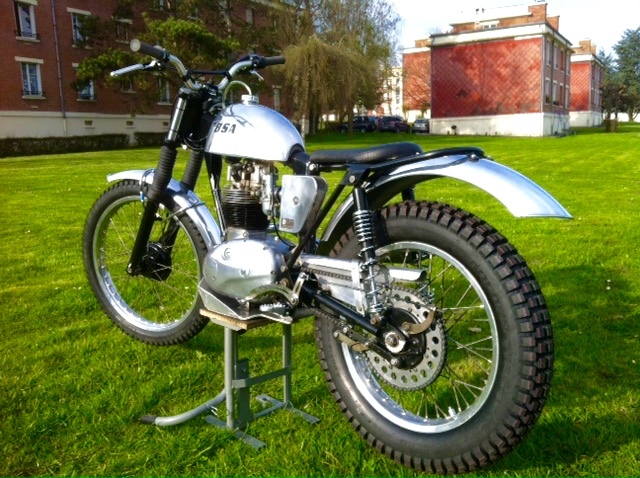 And this bike is for sale for £5000. 15/Sep/2014. This is a Picture of Dave Shave's. 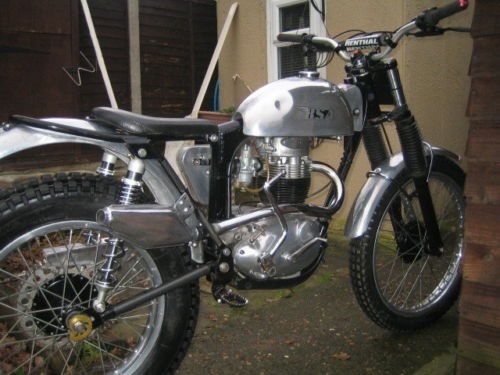 Sammy Miller BSA "Otter" that is for sale at the moment,Below. 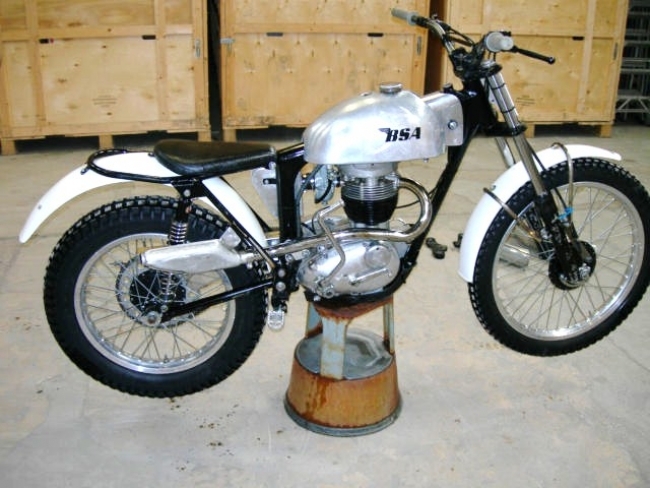 Dave rode this into 25th place in the Scottish Pre65 trial in 2013. as can be seen in the second photo down. Dave says you can still buy the alloy tanks from Sammy Miller Products if you want to put the bike back into Pristine condition. The bike still has the markings from the 2013 Pre 65 Scottish on the head stock. (Another "Otter"that got through the net). but be quick for he may change his mind about selling the bike. Just going through some old files and found Loads of Gems, this is one. Dated 27/00/2007, From the on-line Sammy Miller Catalogue. This is an article from 2001 when Sammy got together with Howard Fawkes to re-introduce the "Otter" frame that had ceased production by Harry Foster. And then unfortunately Harry died just has the frame was being show interest again. What does now make me laugh is the story about how the frame was first conceived. A lot of us would probably believe that this was true. If you had not gotten this BSA "OTTER" web site to prove that statement is wrong (Several-times). But at least Sam brought it back? well that now proves to be wrong too. Because Howard Fawkes was looking at making the frames for a guy named Chris Williams. And we also know that most of the Sammy Parts to be used were produced by Terry Weedy. Funny old world you Know. 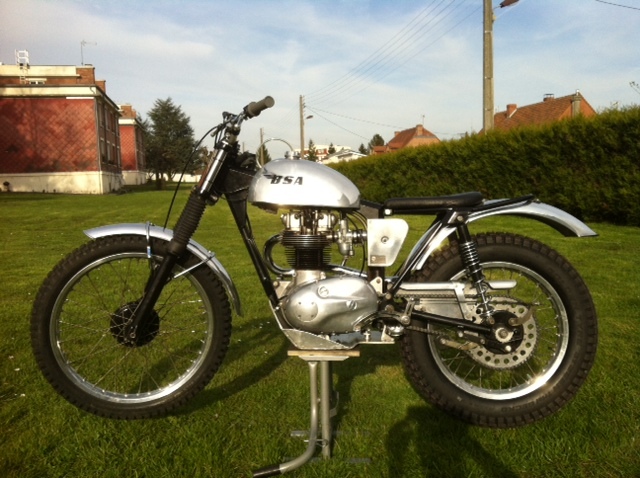 Here is One of the Sammy Miller BSA B40 Otters that went to live in France. The machine is for sale at the moment. If you are interested you can cont owner Fabien Schwarz , by emailing me at bsaotter.com contact me. 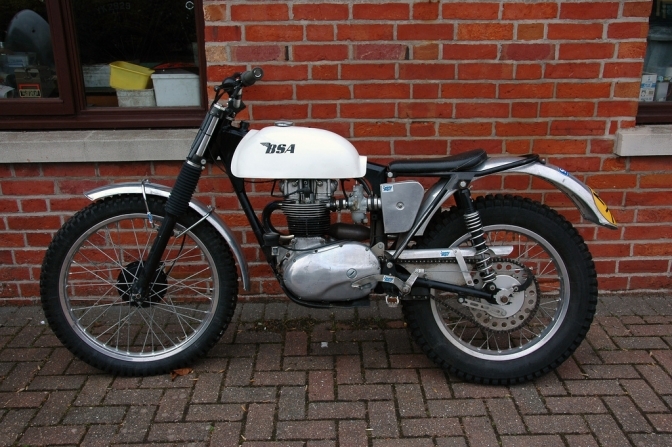 Trial BSA B40 with 1964 Engine Assembled at Sammy Miller. 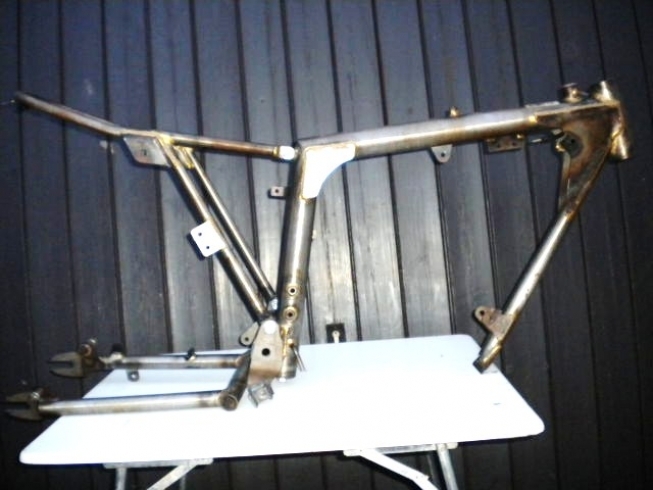 Otter frame, GB military engine with short box and big oil pump. Sammy Miller aluminium parts: tank, air filter housing, front and rear mudguards, AR brake pedal, chain guard, front GB arches. New AR tire and tube, new handlebar and wrist. Gray card normal to my name. 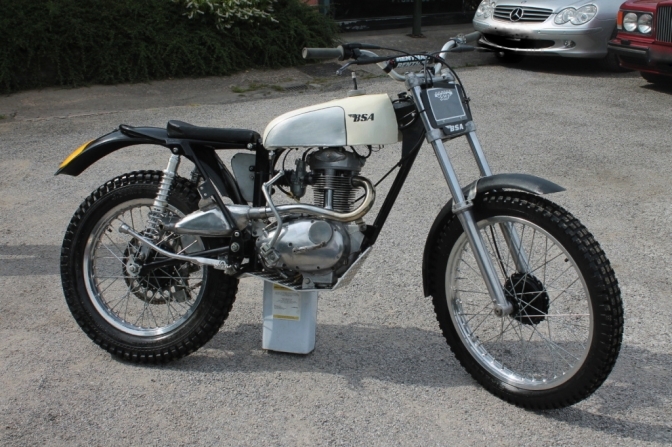 This looks to be a very tidy bike. but most bikes on the continent are kept in pristine condition. This is the Ex Dave Shave bike from above. The new owner that bought the "Sammy Miller Otter" from Dave, died, and the bike was for sale at a Cheffins Auction. There are other photos of the bike. 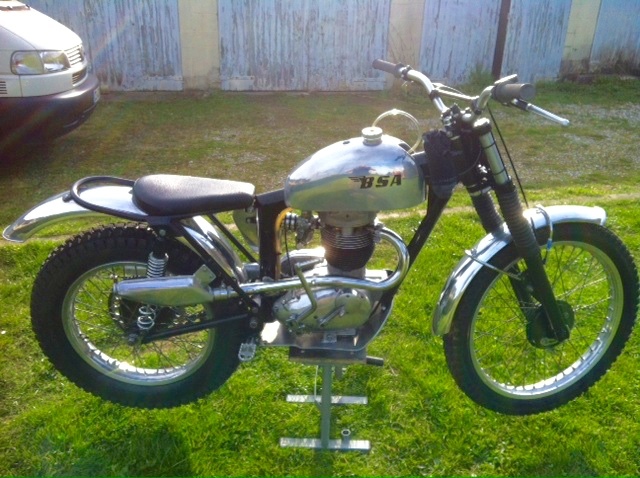 on the BSA Otters for Sale page.